Symbaloo is a free app that compiles web resources into “webmixes” or grids that can be categorized by subject or topic for easy access on your iPad. Webmixes can be created or selected from the hundreds of “shared” webmixes offered in the Symbaloo’s gallery for access to your Symbaloo App. What results is an organized set of icons within the app of your favorite websites or links to documents or presentations on the Internet making them easy to access. Used for personal access or as a place your students can be directed to go via your Symbaloo app on your iPad. 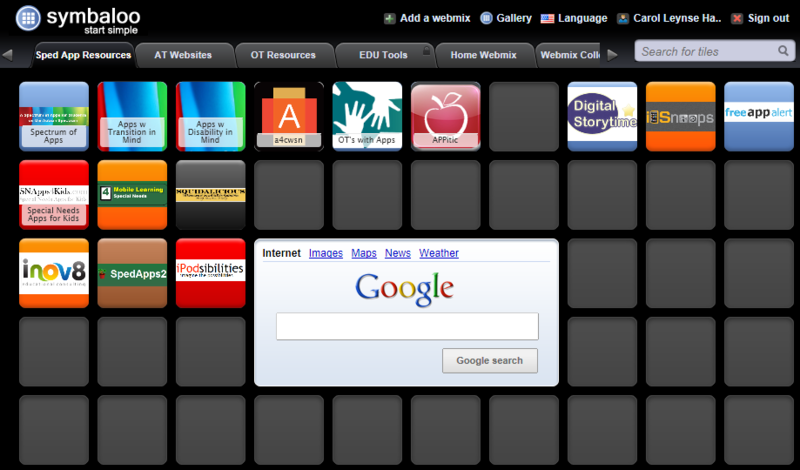 Below is a screen shot of the start of my Symbaloo I created with subject tabs of OT Resources, AT Websites and Sped App Review. I also imported an existing EDU webmix I found that provides many familiar resources (Prezi, LiveBinders, Delicious, TeacherTube, etc.) with a search in their webmix “gallery”. As a visual learner this is a great way to organize web resources and documents that are web based for easy access from my iPad! Each of these icons link to the website as labeled. Much like LiveBinders, this is a great way to organize resources! Symbaloo app is a quick way to access your favorites or frequently used online resources for yourself or your students. Along with establishing single home screen icons, this could be an easy access method for students who physically or cognitively can not enter URL’s into their iPad. I am really excited about using Symbaloo on my iPad! This entry was posted in Accessibility, App Reviews, Apps for OT's, iPad, iPhone, Occupational Therapy and tagged App, iOS accessibility, iPad, iPod, OT Apps. Bookmark the permalink.